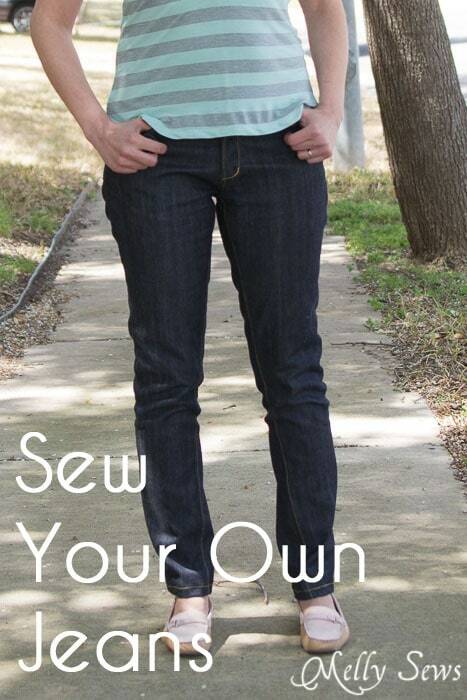 I Dream of Jeanie Big Reveal – I sew jeans for myself! 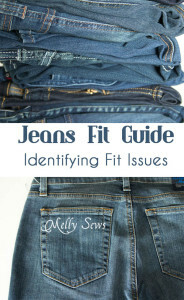 Today’s the big day – I’m sharing my jeans from the sewalong. I actually made two pairs – some from my rub off pattern and some from the Jamie Jeans pattern, both from fabric courtesy of Michael Levine Low Price Fabric. First, lets take a look at my jeans. The fit is pretty spot on, with a couple exceptions. The first being that I have hemmed these too short. But the one other thing is that I somehow got off grain cutting the front left leg – you can see it kind of twisting in the pictures. The back view is pretty good – notice there’s just one wrinkle under the rear – just like it’s supposed to fit. I really think the pocket size/shape/placement is perfect. I haven’t added the belt loops yet though, because I think I made the waistband a little loose. So I’m planning to take the waistband off and redo it. And since I cut them too short, I’m going to go ahead and make them cropped, and shorten them a little more. 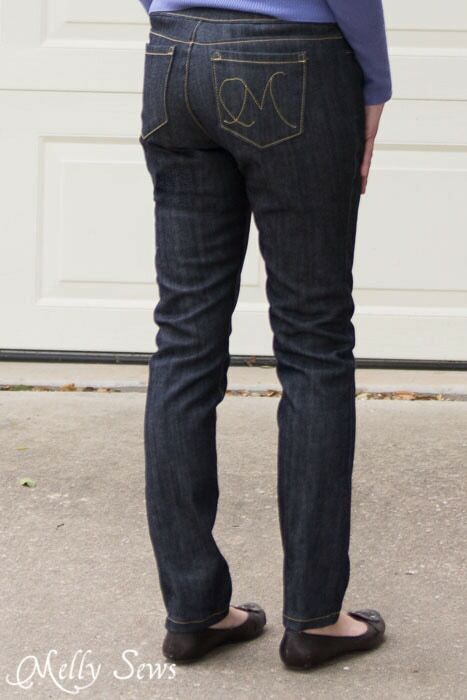 Now let’s talk Jamie Jeans. First of all, I am in LOOOOOOVE with this Grey Italian Stretch Denim from Michael Levine Low Price Fabric. It is the perfect weight, and it is sooooo soft. And it comes in more colors! 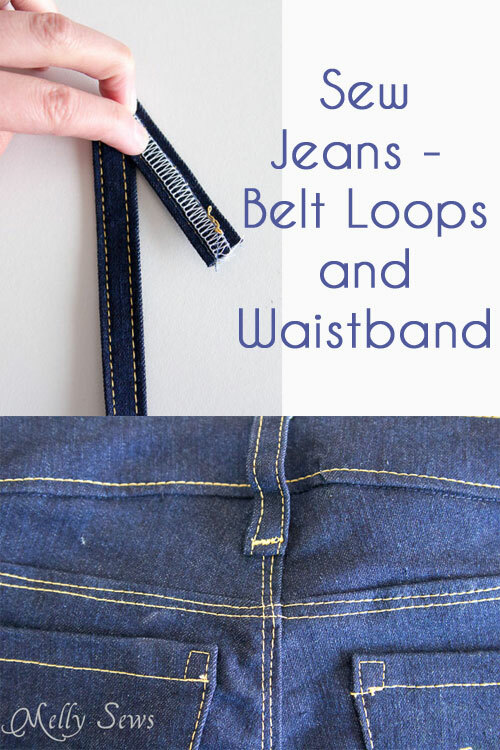 I made the waistband slightly thinner by sewing with a 1/2″ seam instead of the 3/8″ seam allowed. I felt it was a teensy bit too high when I sewed it on as instructed, so that’s the reason for the change. I took the legs in from the thigh down. This was mostly because I needed to make the size 4 to accommodate my hips, but I probably needed the size 2 otherwise. Also this denim has plenty of stretch, so I wanted to take advantage of that with a really slim fit leg. I think when I sew these again, I may try omitting the front leg seam. 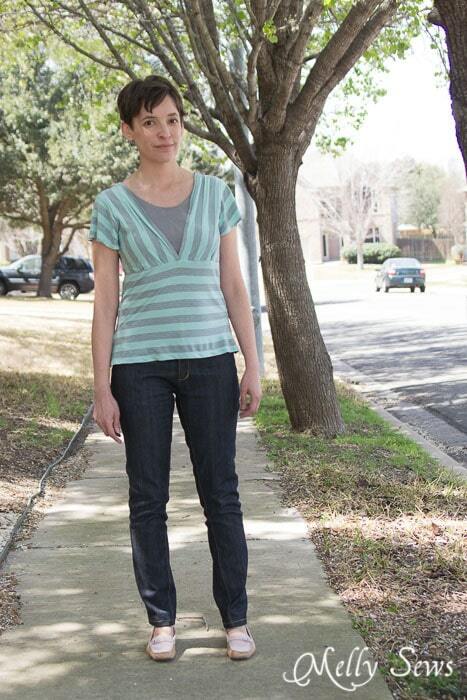 It’s cute, but I also think this pattern would make a great pair of regular, basic jeans without that seam. I did a black corduroy accent on the front pockets. Subtle but I like it. So, there are my jeans. 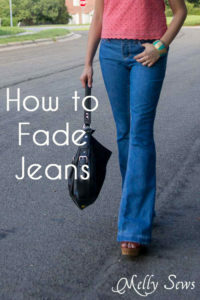 Check out Sabra’s jeans here. And please show us your jeans! Tag @mellysews and @sewastraightline on Instagram and use the hashtag #iSewedJeans so we can find your photos. Can’t wait to see! If you’re not on Instagram, you are also welcome to share your jeans photos on my Facebook page and Sabra’s Facebook page. 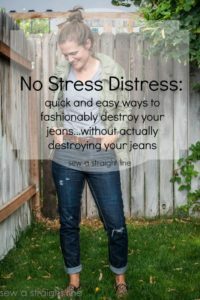 Want to see all the jeans posts we’ve done? Click on any picture to go to the post. I’ve had the inseam twist on jeans before and I think in my case it came from trying to straighten the grain before cutting. Some denim just has natural pull off grain due to the twist of the yarns, at least that is what I ran across in discussions. 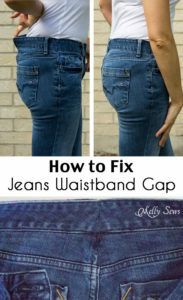 Home sewers are often complicated routines for fixing the grain of fabrics but in the case of denim this can be self defeating. In my case, I had carefully cut the ends of my fabric along a cross grain, then lined up the cut edges and steamed and ironed until I could get the selveges aligned as well. The reward for all this was my completed jeans twisted like yours. My new routine for denim, fold it and match the selvages but do not consider the cross grain. This way the visible side of the pants is on grain and you aren’t fighting the natural pull of the fabric. But all-in-all it’s not the worst problem in pants, and I found some vintage jeans aficionados actually look for this inseam twist because vintage denims were all made from these biased yarns. 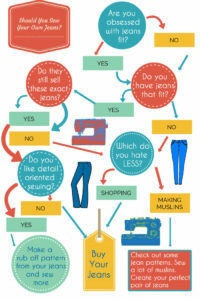 There are some modern denims which use more than one yarn twist and don’t have this property but it’s impossible to recognize if you aren’t buying direct from a manufacturer. I forgot to say both pairs look amazing! 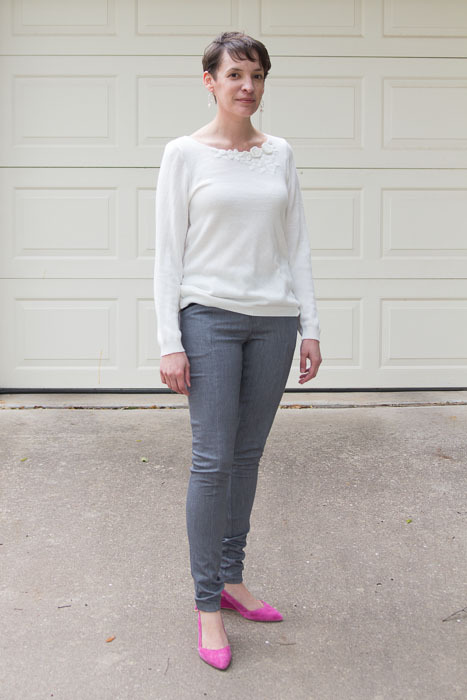 I have plans for grey denim this spring, yours is a lovely shade and ought to mix well with tops. I’ve also contemplated Jamie’s without front seam, mostly because I’ve made three with and that seems like enough for now. I’ve traced a modified front, just haven’t sewn it. What fabric did you use for the first pair? I can’t get over how amazing the rub-off pair look! I am totally doing that next! Both pair of jeans look great! I love both pairs! You did an amazing job! I totally agree with Jennifer about the way the straight of the grain is on the bolt. when I was still making my daughters jeans I found cutting pieces singly worked better. Both pairs fit like a glove, which is obviously the point of making your own. I love the first pair. 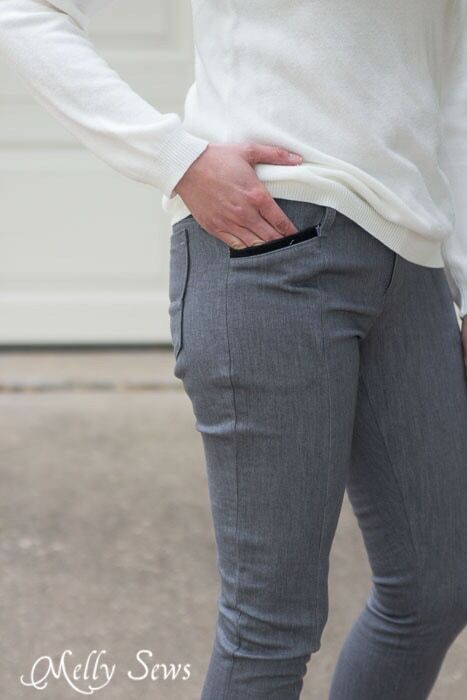 The pockets are in exactly the right spot for you and they make your derriere and legs look fabulous! 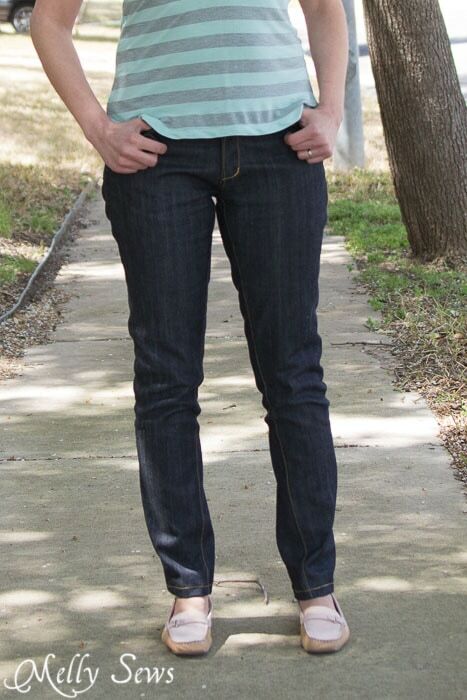 I actually really like ankle length slim jeans. You and Sabra are really convincing me to give it a try. I’m getting really tired of having to alter waistbands to fit. I love the grey pair, I would never guess that you made these! These are just amazing! I can’t wait until life settles down just a bit so I can read through all these amazing posts and make a pair for myself! I actual love the length of the first pair! I think the fit and length is perfect! Incredible!! Amazing job! I am in awe of you and your talents and you just may have convinced me to take the leap instead of altering one after another. I love the fit of the second pair although the first are very flattering! I would love to see a pic after you crop them. Thanks for this! Wow! You’re jeans look fabulous! 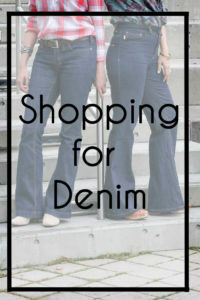 Do you have any tips for sewing with stretch denim? 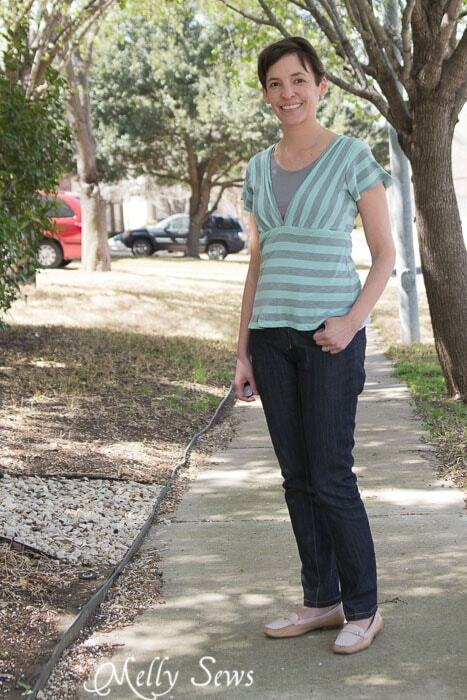 I am just now fixing to purchase the Jamie Jeans pattern, but having had 1 bad experience sewing stretch denim (stretching, waviness, yuck) I’m trying to research a little bit first so I don’t royally mess them up.